Not a Zazzler but want to be an affiliate and earn good money? 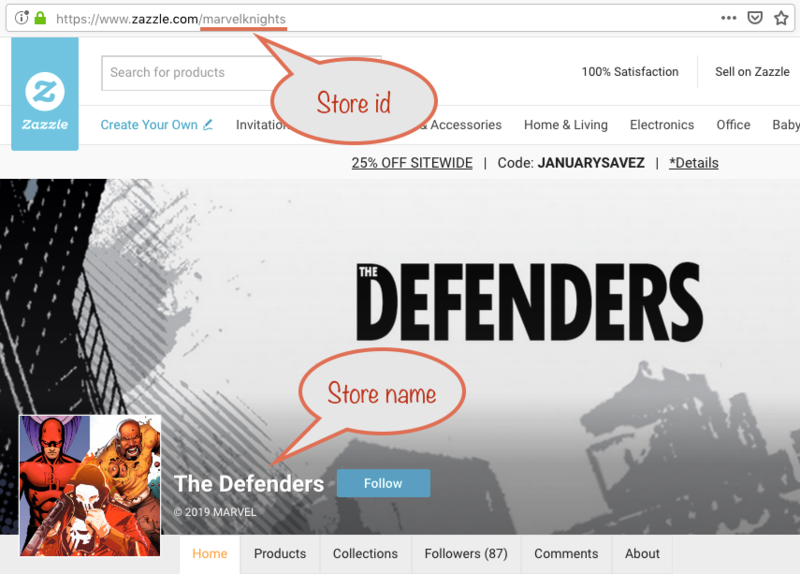 How do I become a Zazzle affiliate? Visit Zazzle's Associate Program page and sign up there. Zazzle's program is one of the best in the affiliate marketing world. As long as you're able to get relevant eyeballs to your site / blog, then you'll be able to earn referral commission. What products do I promote - how do I find them? You find the stores and collections you like by visiting Zazzle, looking at suitable designs and seeing the storename of the designer and any collection(s) the designs appear in. 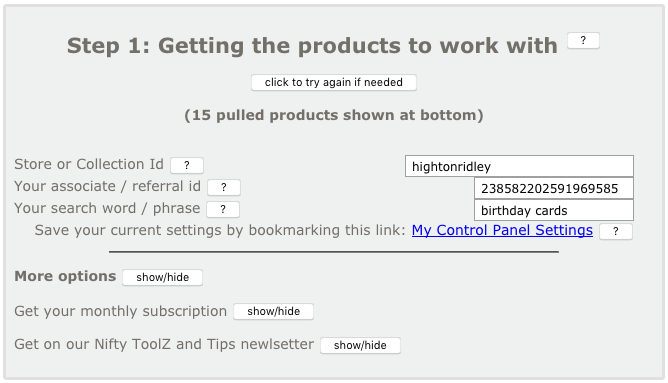 Where else can I get help on using the Nifty Promo Control Panel? More than that, whether they buy or not on that first visit, you have 45 days from them first clicking the link for them to buy. Anything they do buy during that period will earn you the 15% referral commission. There are some ifs and buts, such as their browser allowing cookies, and there are some circumstances where someone else's referral id can override yours. See Zazzle's help system for more on this. What is a 50/50 referral split? All tools available via the Nifty Promo Control panel are free to use without a subscription. When you don't have a subscription, then to help pay for the server, tool development and maintenance, half of the links made will use your referral id and half will use ours. Which is which is chosen at random, with a computer toss of the coin. Note that if any of the products such a person buys are from your store, you'll get and keep all royalties due. How do I make sure I get all the referral commission due? You need a subscription. With a subscription, all links will always your referral id - provided you give it in the first place. See the separate FAQ entry about subscriptions. They're designed to give you feedback on how well (or not) your promotion in different places is working. If you make sure you make up tracking codes specific to each, you'll then know where's working and where's not by looking at that report. What does "pull from Zazzle mean"? It means to make a request from Zazzle's rss feed mechanism and get given back in return the products that fit the request made. Whoa - what's this rss feed mechanism? Ah, that's a separate question. For now, just think of it as a black box - requests get stuffed in and out pops a bunch of products - what happens to them next is up to whatever did the requesting. How do I tell Nifty I want to promote products from my store? We'd call that "pulling from your store" and you do it by giving Nifty your store's url name - what we call your "Store Id". By that, we mean the part of the Zazzle url that identifies your store. We need to be precise here because there's also a store name you chose when you originally set things up. It's the one that people see in your store's banner area. 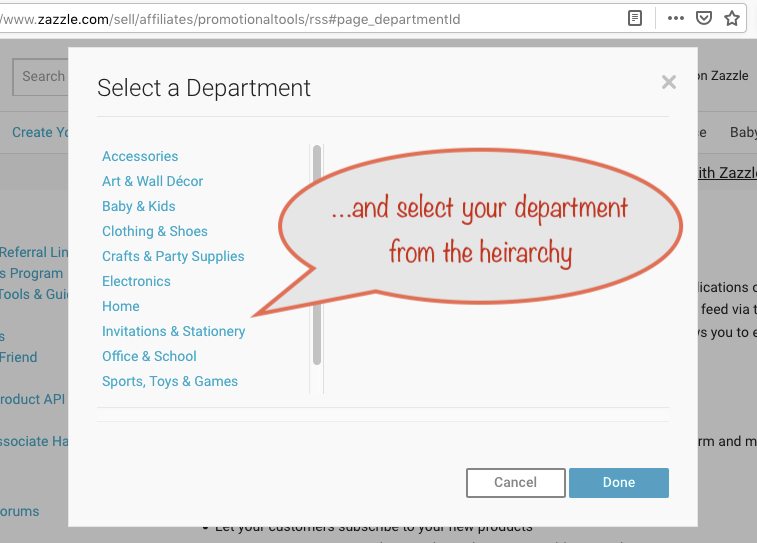 Just remember that you always use your Store Id in the Nifty Promo Control Panel. 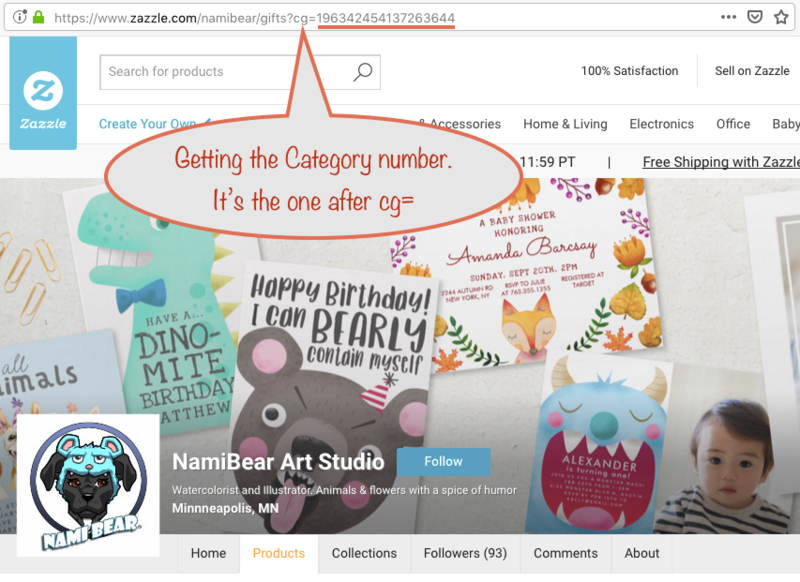 Note that if you want to pull from Zazzle's marketplace, just leave the store / collection id blank. What about getting products to promote from a collection? How do I use a search to get products to promote? In the example shown we're searching for birthday cards. It doesn't matter if you use upper or lower case or a mixture - they all work the same. If you're using more than one word, use a space to separate them. What you get back depends entirely on how Zazzle interprets your search term. If you like, you can combine a search with a store id but note that any search terms you give are ignored when pulling from collections. Don't use quotes, commas or special symbols, as the results can be unpredictable and likely not what you might expect. 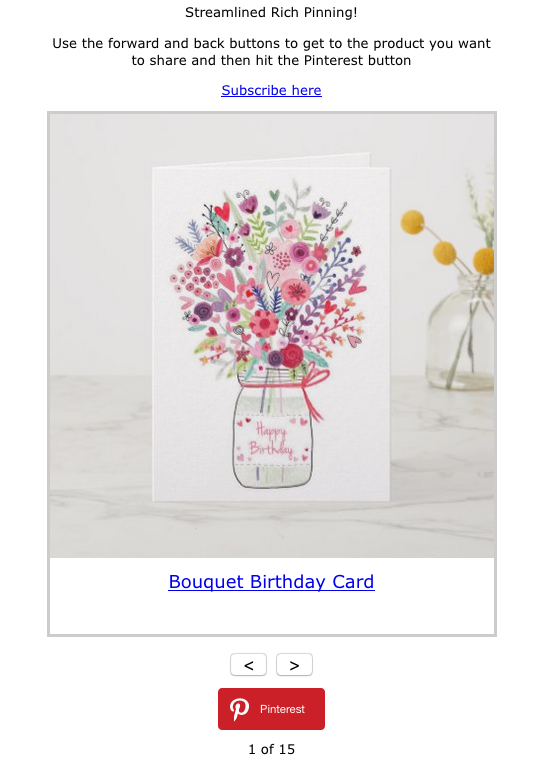 Note that the best way to make sure you only get birthday greetings cards, and not other types of cards, is to be specific by using a department id (see the Advanced FAQ section for more on using departments). Is there a way to "lock in" my settings for later? Yes. What you do is bookmark the link that's provided just for this purpose. All you have to do is right-click that link and add it to your bookmarks. When you next visit that bookmark, all your settings from before will be put back. What's the best way for a beginner to promote? While you're getting used to things, probably the best way is to share individual products on social media like Pinterest, Facebook and Twitter. When you click the "show/hide" button you'll see the choices you can make. Do add something unique to the default tracking code. The default will automatically have the channel added at the start once you've choose your sharer. This is the Pinterest Individual Product Sharer. You move through the slides with the forward and back buttons and when you reach a product you want to pin, just click/tap the red Pinterest button. You can get up quite a speed this way. 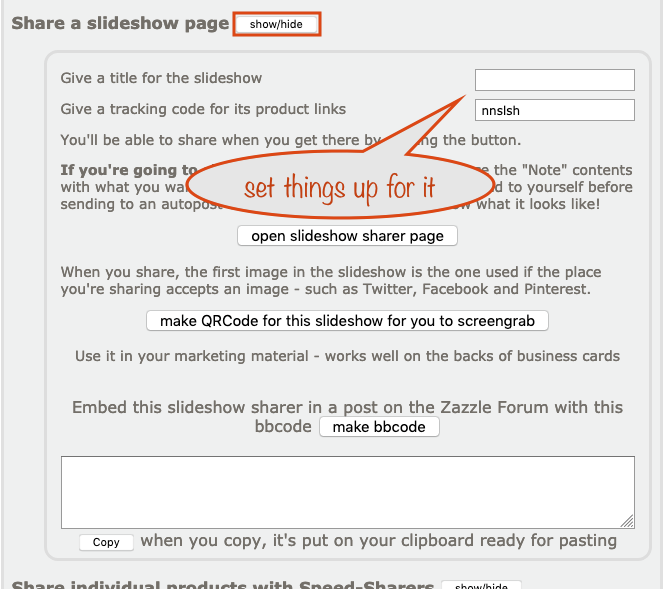 Note that the Zazzle Forum choice will give you what you need to paste into a reply on the Show Me Forum. Why not have a go? It's a great way to get used to using Nifty in a friendly environment while showcasing your designs at the same time. I don't have a website or blog, so how can I share a slideshow? There's also an option to make a QRCode graphic for you to use on flyers and / or the back of your business cards. When someone points there camera app at it, the majority of mobiles will open the slideshow in their web browser app. 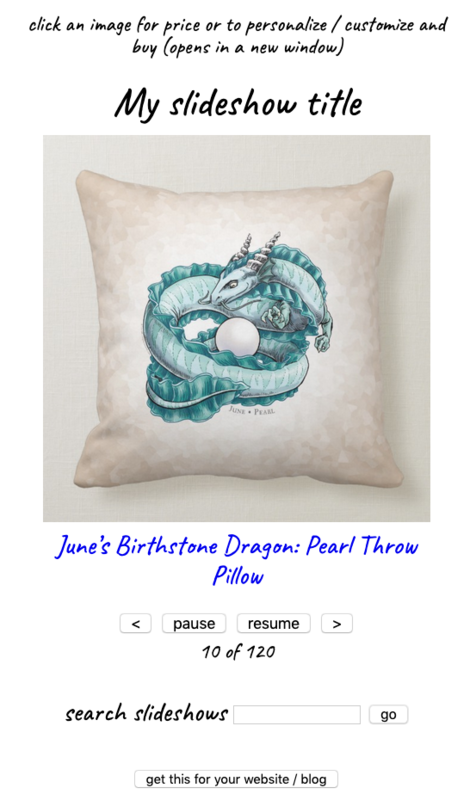 How can I change how many products get requested from Zazzle for onward promoting? If Zazzle has more than this number, you can ask for a different "page" of results. What is the "Product background color" option for? Is there anything special about pulling from Collections? Yes. There's a few things to know. 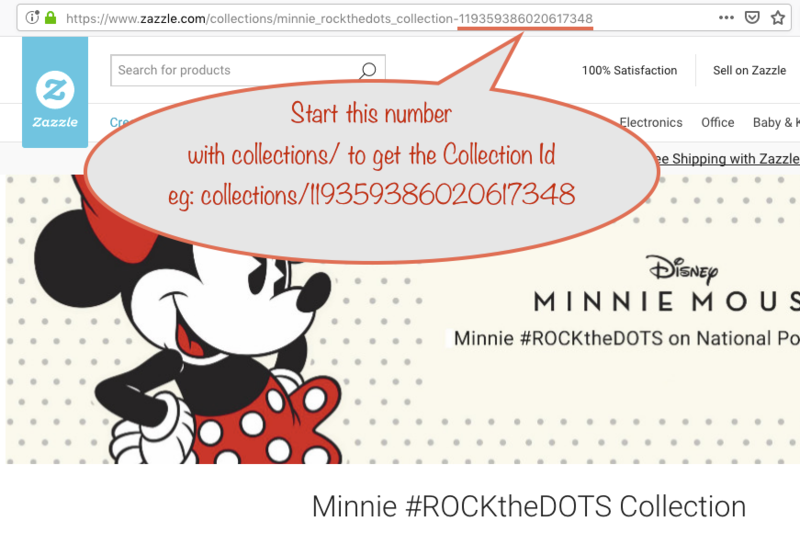 The first is that the maximum number of products you can request with collections is 240. But before you use such large collections, think of your visitor and their internet connection / data allowance. Collections are a great way to go because you have full control over what they contain and the order of the products in them. You can make sure the designs all go together in some way and encourages multiple sales / referrals. These settings, if you've used them, will be ignored and make no difference when pulling from collections. One thing you must remember is not to delete your collection if you've shared either a slideshow page or product grid page based on it. It's because those tools pull afressh each time it's visited. Another thing that can mess those pages up is during those times where collection content disappears after you add to / remove from or reorder their content. It's a Zazzle thing that's got nothing to do with Nifty. What do I need to use the nIFTTTy Scheduler? 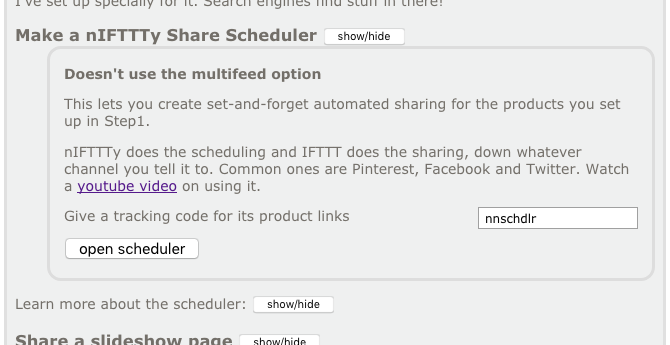 The nIFTTTy scheduler works in conjunction with the well-known IfThisThenThat (IFTTT) to do automatic, unattended sharing / pinning for you. It stands for If This (some form of online thing happens) Then That (do some form of online action). The way we use IFTTT, explained in English, is like this: If the feed url produced by the scheduler has a product in it, Then tweet it, for example. 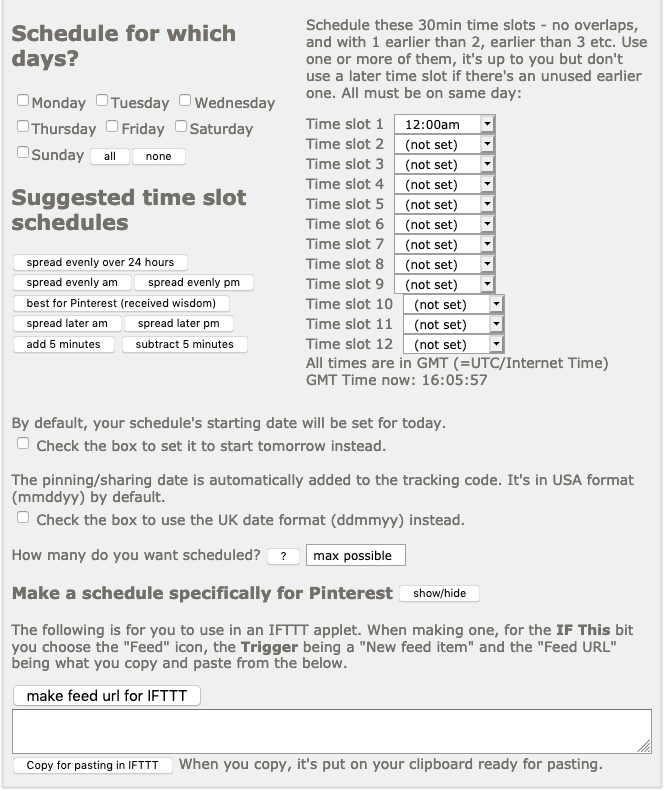 So to use the nIFTTTy Scheduler, you need an account with IFTTT, connected to the social media accounts you're going to use. To actually use it, paste the feed url you're given into a new IFTTT "RSS Feed" applet and complete the applet's setup. When you've done that, IFTTT will then check the applet every 15 minutes or so, "pulling" the feed url and doing its action if it gets something from the pull. It will only get something if one of your chosen timeslots is active, on an active day. If the applet has never seen that product before, then it carries out the action you set up the applet to do. If it has seen it before, it ignores it and does nothing. The feed being pulled is programmed to advance through the products it in turn is pulling from Zazzle, working out which one to give out, based on when the feed url was created and the number of timeslots that have passed since then. The feed will continue doing its stuff as long as Zazzle has matching items or around 1000 products have been reached. Why? It's because that's the maximum you can get at using Zazzle's RSS feed mechanism. 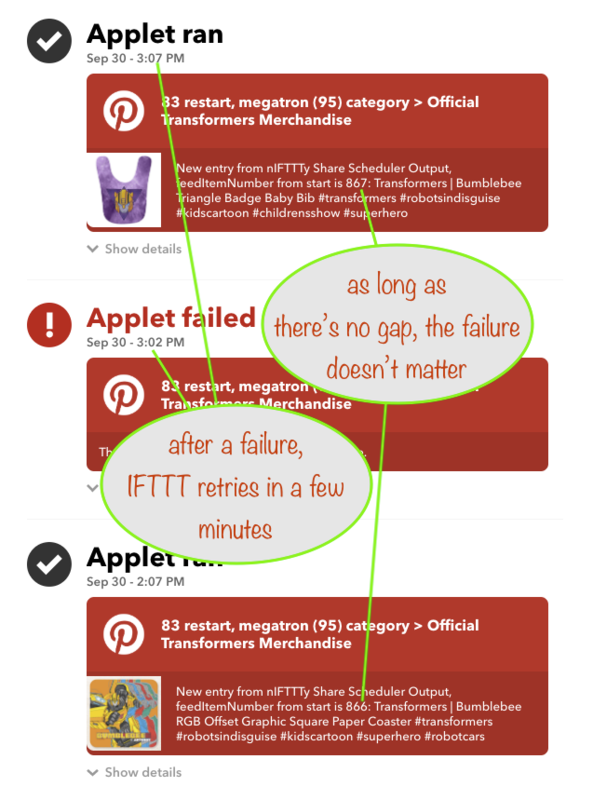 My IFTTT nIFTTTy applet is giving "Applet failed" messages - should I worry? Probably not. 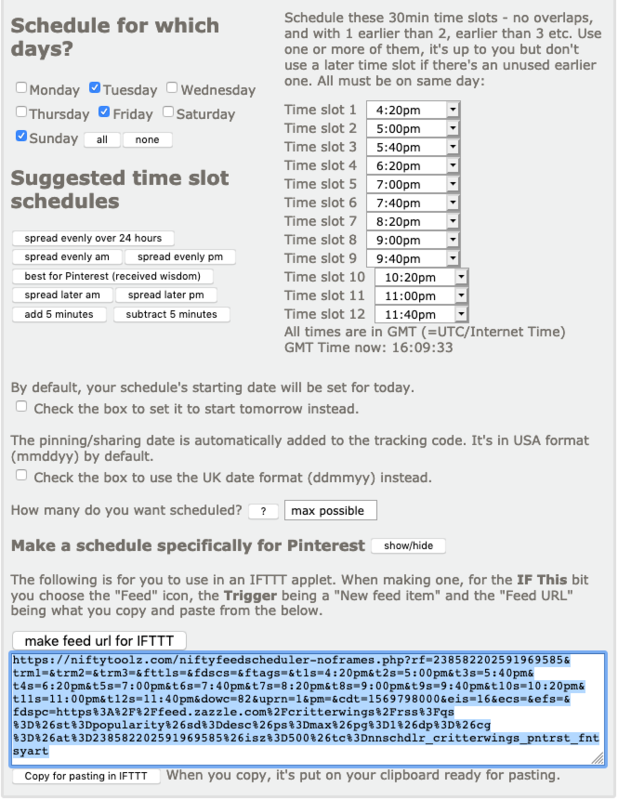 If your IFTTT nIFTTTy applet is failing outside any active timeslot it's not an issue. If it runs successfully during an active timeslot, even if it failed during the same timeslot a few minutes earlier, then it's not an issue. Do remember that a timeslot remains active for 30mins from its start time. If you get nothing but failures for an applet that was working before, it's 99% for sure that your nIFTTTy schedule has run out of items. In that case, just delete the applet. If I switch off a nIFTTTy applet and then switch it back on later, will it pick up where it left off? No. You see, the way that the nIFTTTy scheduler works means that can't happen. When you first make your schedule, the date it was made is included in the feed url generated and this is used to work out each time which product to choose. At 12 items per day, if 5 days have passed (toady's date minus the date it was made), then the 61st product in the feed from Zazzle is the one to use first on day 6. Even if you have the applet switched off, days still keep passing. How do I pull a particular type of product / from a department? When you click the link, you'll be given the department lookup tool. Just navigate as far down the hierarchy as you need, to get what you want. I want to pull from a category - how do I do that? 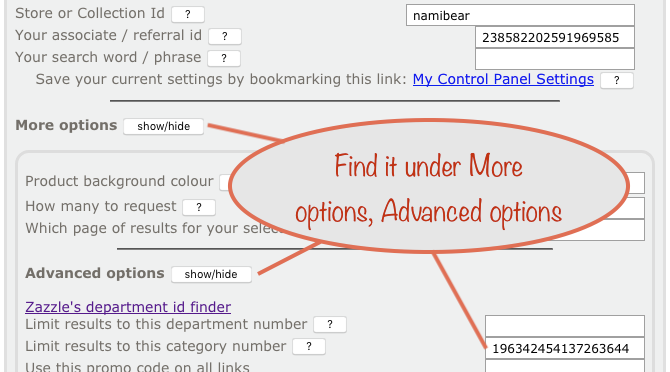 You need to get to the Advanced option, under More options, where you'll find where to put in the Category number. Note that if you use a Category number, technically you don't need a storename - but we always put one in as a reminder of whose category it is. What will go here when this is next updated? What do I get with a subscription to Nifty? With a subscription, no more 50/50 referral split - all generated links from that point on will always use your referral id. 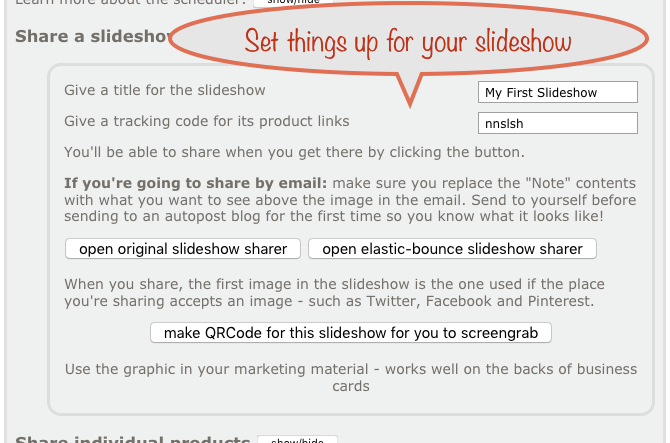 Note that this also applies to previously made slideshow / product grid sharer pages. This happens because the subscription check takes place as product links are created - and the 'live' nature of those pages means everything is regenerated when a visitor visits them. You also get up to 25 nIFTTTy Scheduler applets active at any one time. By active, we mean they are switched on. If you go Pro, you get up to 25 nIFTTTy Scheduler applets active at any one time (split however you like between Zazzle and Society6). A time lag of around 1-3 months is usual to start getting regular referrals. If, for some reason, you find you're not earning enough income from Nifty, you can cancel your subscription. Everything will carry on working as usual but all your future product links will revert to the 50/50 referral split. 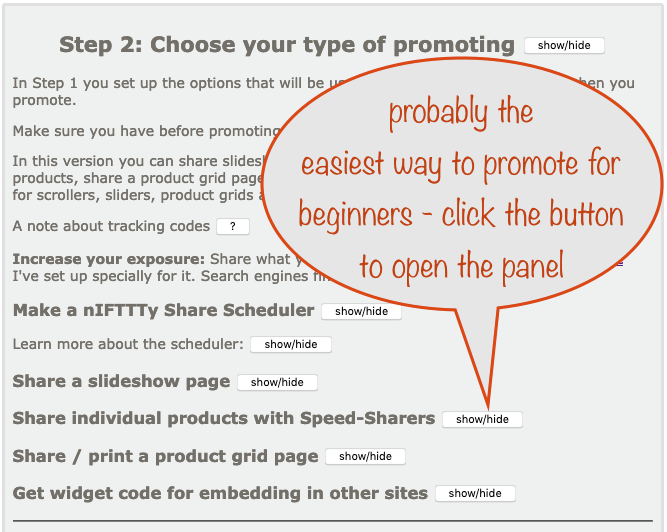 Note that this will also apply to links in any product grid or slideshow sharer pages you may have made. This happens because the subscription check takes place as product links are created - and the 'live' nature of those pages means everything is regenerated when a visitor visits them. Are there any videos showing how to do stuff?